What is Custom Sunglass Designer App? How does the Admin's Apps Products Look? How to Add Customization in Admin? How to Add New Design from Admin? How to Upload Front Part of Sunglass? How to Upload Left Temple of Sunglass? How to Upload Right Temple of Sunglass? How to Upload Lens of Sunglass? How to Design Content for Frontend Panel? How does the Frontend's Customize Button Look? How does the Frontend's Design Panel Look? How does the "Sunglass Design Panel for Men" Look? 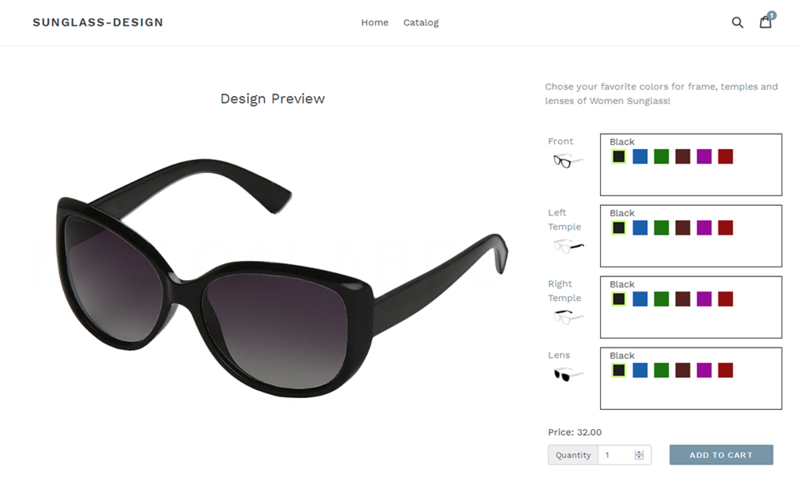 How does the "Sunglass Design Panel for Women" Look? How does the Frontend Cart Page Look? Thank you for purchasing our amazing "Shopify Custom Sunglass Designer" Apps. If you have any questions that are beyond the scope of this help file, please feel free to email via our user page contact form to get everything you need. Thank you so much! What is Custom Sunglass Designer App and Why Should You Buy It? 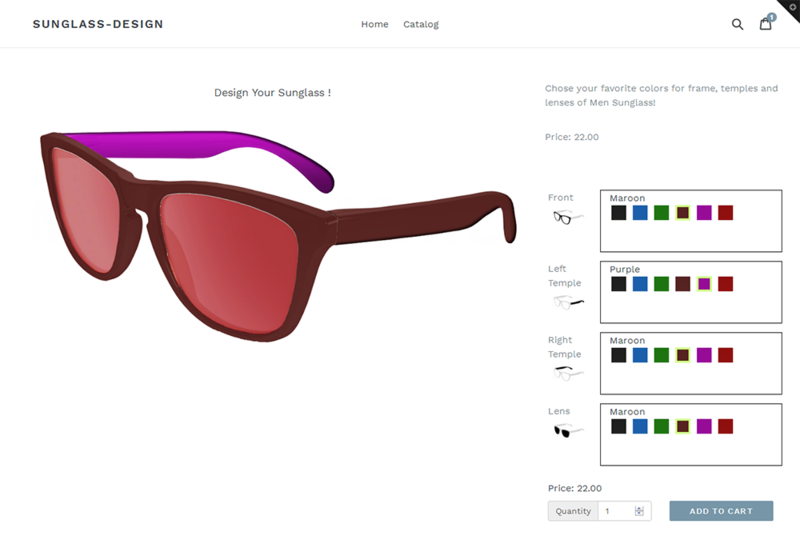 “Shopify Custom Sunglass Designer” is a shopify app which is used to easily design or customized sunglass through online. Customers are instantly able to design their own sunglass and this is easy way to design from online. Just click a button and select their preferred frames, lenses or glass. By this powerful app customer can design the sunglass as per their need such as choose front frame, left temple, right temple and lens or glass. Shoppers can “Add to Cart” the sunglass with quantity from design panel. 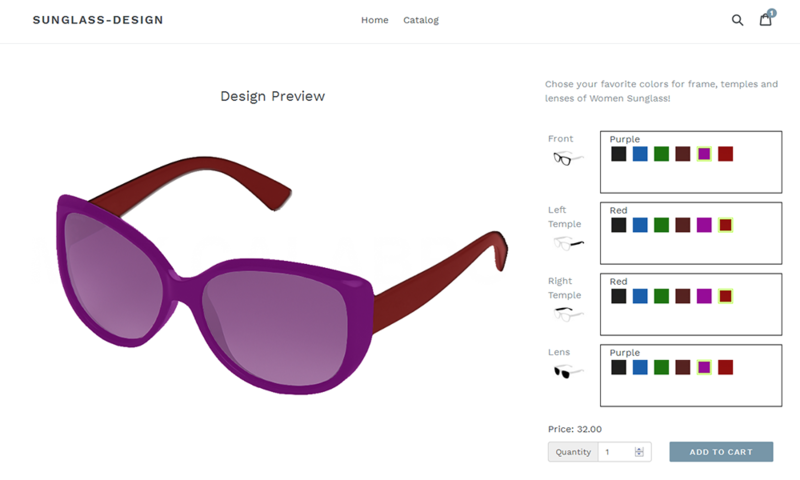 “Shopify Custom Sunglass Designer” app has some excellent features and easy to setup. This app is more flexible and compatible with many existing apps in the Shopify repository. This app is fully customizable. Users can easily configure the app into the new or existing shopify store. Shoppers can choose their preferred lenses and frames. Shop owner can upload frame, lens as well as design thumbnails from apps admin. Shop owner can enable, disable or delete customization for specific product. 2. Now hit our Apps URL and click on to "Get App" button. For show this application in your theme, you should add some code in your template. So total process is given below. Step 1: At first Create/Add a new snippet with named “sc-csd-btn-loader-150812.liquid” at Snippets folder of theme editor. Now just put the following code. 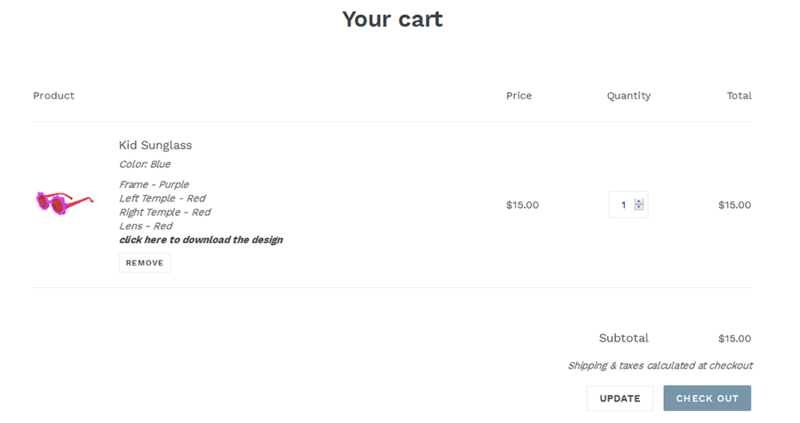 Step 2: Add the following code just after "Add to Cart" button code for product page. Sectioned Theme: Click here to add the above code in product-template.liquid. Non Sectioned Theme: Click here to add the above code in product.liquid. Step 3: Add the following code for cart page. These codes are for showing "Download Design" link in the cart page. Sectioned Theme: Click here to add the above code in cart-template.liquid. Non Sectioned Theme: Click here to add the above code in cart.liquid. 5. So your application has installed. Now go to “Apps” menu of Admin Dashboard and click on the “Custom Sunglass Designer” Apps link. 6. 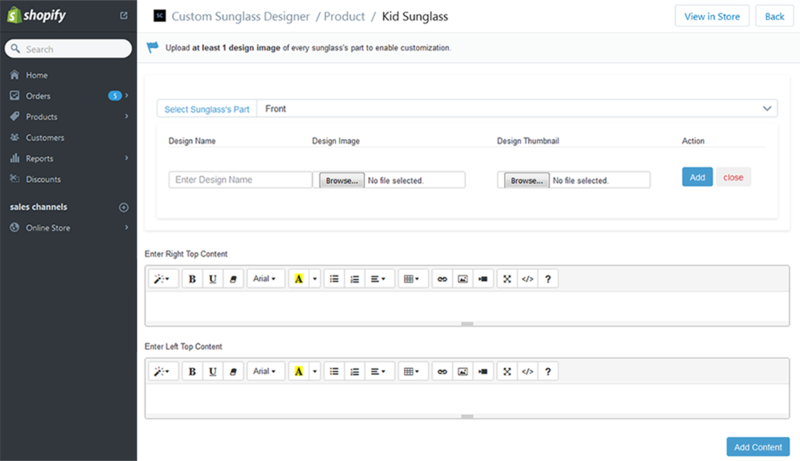 Now click on any sunglass product and upload the Front, Left Temple, Right Temple and Lens images. How to Select Sunglass's Part from Admin?